My husband and I were introduced to a new game at a friend's house Sunday night. 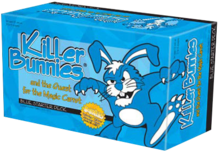 It's a card game called 'Killer Bunnies' that we'd seen before, and being avid 'board' gamers (or card games in this case), we had seen it in the store and wondered if it would be fun. Our friends pulled out the important cards and took ten minutes to explain the somewhat straight forward/ somewhat complicated rules and card purposes. Then the uttered the phrase that I think gets said just about every time you teach/learn/see a new game. "It will make more sense as you play." I've said it before, I've heard it before, and it's completely true. Sometimes no matter how clear and thorough you try to be with an explanation, the best way to learn a new game is to play it. I can't help but feel it's true to writing as well. We can and should read and research and learn the somewhat straight forward/ somewhat complicated rules grammar and pathway to publication. But it isn't until we actually sit down and right that all the pieces come together, skill and talent merging, to allow the task of writing to make sense. And if you're looking for a fun new game, I recommend Killer Bunnies. My husband and I love Killer Bunnies, but because it is so complicated we feel like we can't introduce it to just anyone who might come over. Only friends and family who will play again after the first time. This metaphor actually gives me a little bit of courage with my WIP - aspects are intimidating, but if I dive in they will hopefully make more sense. It's so true - we gain more by doing something than just by hearing it - though the instructions and explanations are certainly essential too. You have to know how to play the game in order to fully enjoy it. We have so many expansions to Killer Bunnies. We played that game until I can no longer look at it without groaning! LOL! But you are so right about that game. It really is just one you have to learn as you go. Just like writing!